It’s always a joy and a great blessing to be with Lhasray Rinpoche. We presented him a small Buddha image Dr. Bundit gave me, an English translation of Shadza Rinpoche with a Tibetan text published by the Snow Lion Publication (Shadza Rinpoche is Rinpoche’s root lama), and copies of the Stupa brochure. These represent Buddha’s body, speech and mind. We also presented him Areerat’s gift and Dr. Anuparb’s medicine. Rinpoche and his family took us to a Hot Pot dinner as usual. We missed our friends who couldn’t be with us. We were with Rinpoche from 2 pm and didn’t go back to the hotel until midnight. It was a special time that we spent discussing how to go about constructing the Tara Great Stupa. Before we retired to our place, I asked Rinpoche to recite a prayer to an American nun who is gravely ill. We jotted down her name in Tibetan for him. She’s so lucky to receive his blessing even though she’s never met him and she’s so far away. May she experience no pain and recover soon! 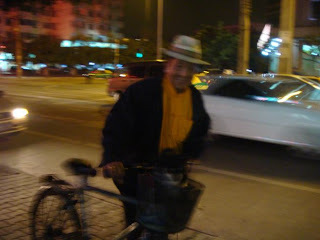 Photo: Rinpoche and his bicycle on the way back from the hot pot.